This week, Marty's Market hosted a screening of the documentary, The End of the Line. Marty's has recently partnered with the Monterey Bay Aquarium to sell seafood that is approved by Monterey Bay's Seafood Watch program, so this was a fitting educational program for them to host. They also are partners with the Pittsburgh Zoo & PPG Aquarium - the first store in the area to do so. The film highlights the myriad of issues that overfishing creates - from environmental issues like drastically changed ecosystems. When a species higher on the food chain collapses, there is a proliferation of the lower species. When those are overfished, there's no way for the system to rebound. Bi-catch is also a big problem - the other sea life that is caught in trawlers and nets in addition to the intended population - making up 1/10 of what is caught. Bi-catch goes back over the side of the boat, dead. Bottom trawlers drag the ocean floor and destroy the life on the sea bed. None of it is so simple as putting a lure on a line on a fishing pole, which is the idea we have about fishing from the recreational fishing that people do as a hobby. 1.2 billion people depend on seafood as a key part of their diet, and many hundred thousands of jobs are dependent on it as well - everything from indigenous fishermen to international corporations. Overfishing might sustain jobs now, but as the populations of the fished species dwindle, those jobs will disappear anyway, since there will be no more fish left to catch. This is where the logic behind quotas and protected areas comes into play - but these are often completely disregarded. Indigenous fishermen in developing nations are also threatened by their own countries selling the rights to off-shore fishing to developed nations. The coastal areas where theses people have fished for centuries are now depleted, making it harder and harder for them to make a living in their own home areas. 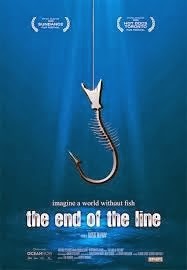 The film also touches on farmed fish - often thought of as the solution to dwindling wild populations. But the problem is that farmed fish EAT wild fish. So using aquaculture for a species that eats fish isn't actually sustainable in any way, since it takes many pounds of fish like anchovies, herring and mackerel to feed the farmed fish that seem to be such a great idea. There are also problems with these fish farms polluting and/or contaminating the wider ocean. One of the ideas this film presents that I hadn't really considered before was how we look at seafood as a different type of life than other animals, like dogs, cats, zoo animals, or even livestock. If restaurants served panda on their menus, the public would be outraged. Endangered species! How can we eat them? But yet restaurants across the country highlight bluefin tuna, which is highly endangered. As a society, we classify the life of animals according to our own use. We wouldn't treat our dogs the way we treat cows and pigs. And we definitely wouldn't treat a panda or cheetah the way we do bluefin tuna. So what do you do? The film suggested asking your legislators to "respect the science" - which I think is a great way of phrasing that governments can't let private interests try to refute established scientific evidence. Both the film and Monterey Bay also suggest asking businesses and restaurants - is your seafood sustainable? If they answer that they don't know or say that it isn't, ask them to look into the issue and leave them with a Seafood Watch card. Also, if you're going to purchase seafood on your own, choose from the Best Choices list, and from the Good Alternatives list, if the Best Choices aren't available. Look for restaurants and businesses that prioritize sustainability and support those organizations. Download the Monterey Bay Seafood Watch app and check it out the next time you're in the market for seafood. The documentary was very interesting! The app is also a nice tool. Next Gen House turns one!